Dr. John Claiche is a pathologist from Placerville, California. He has been working in the medical field for more than 40 years. Dr. Claiche graduated from the University of California Davis School of Medicine and continued with his internship at the Community Medical Center - University Medical Center and a residency at the University of California-Davis. He is a board-certified specialist in anatomic pathology and clinical pathology. Dr. Claiche also contributed to two published studies that focused on focal eosinophilic granuloma of the temporal lobe and NaCl infusions responses. 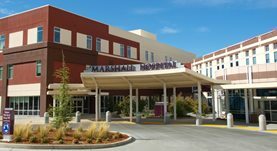 Dr. Claiche is currently affiliated with the Marshall Medical Center in Placerville. Dr. John Claiche has contributed to 2 publications. Focal eosinophilic granuloma of the temporal lobe. Case report. Sivalingam, S., Corkill, G., Ellis, W. G., Claiche, J. R.; J Neurosurg. 1977 Dec.
Dissociation of calciuretic and natriuretic responses to NaCl infusions in adrenalectomized dogs. Schmitt, G. H., Tsao, M. U., Tjen, J., Claiche, J. R., Cwalina, J. T., Mosson, J. D.; Metab Clin Exp. 1971 Sep.